December 27-30, 2018 at the San Diego Convention Center. The San Diego International Auto Show will feature over 400 2018 & 2019 model-year vehicles, ride and drives, expanded exotics salon and much more! Owned, produced and presented by the New Car Dealers Association, the San Diego International Auto Show has grown to become the second largest auto show in California and the highest-attended consumer event at the San Diego Convention Center. 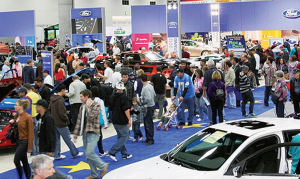 Chosen as a global destination for manufacturers to showcase their products, the San Diego International Auto Show – Where the Cars are the Stars ® – is one of the primary means of stimulating automobile sales throughout the county. One of the keys to the Auto Show’s success each year is the extensive media coverage prior to and during the show. The NCDA’s media partners play a critical role in advertising the San Diego International Auto Show and supporting the show’s public relations and marketing efforts. Visit the San Diego Auto Show web site.